Slipping in with just minutes to spare, one more entry for Raiders of the Lost Cocktail. * Each month, the [previous month’s winner] will select a cocktail ingredient, which is accessible but not currently in vogue. * Each month, readers are invited and challenged to scour all published sources (old books, new books, red books, blue books… plus magazines, databases, matchbook covers) to find worthy cocktails that use this ingredient, and potentially merit revival and rediscovery. * Entries must be previously published recipes, and include recipe, source, author, and when possible date of publication. * Recipes don’t have to be unique to that publication. * Entries will be judged on overall quality and appeal. * Preference will be extended toward recipes which use relatively common ingredients, thus allowing this recipe to be prepared at a wider majority of bars. 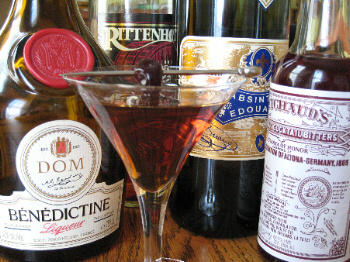 Well, color me repetitive, but when the topic is “Benedictine cocktails,” there’s one that always springs first to my mind, in part because it’s an intriguing once-forgotten classic, but also because it’s just so damn tasty that it’s usually on my mind to begin with: the Cocktail a la Louisiane. I first came across this drink while trolling in the backwater over at Chuck Taggart’s Gumbo Pages, but it wasn’t until I saw the recipe again, in Stanley Clisby Arthur’s Famous New Orleans Drinks and How to Mix ‘Em , from 1937, that I clued into the idea that I really should try it out. Y’see, at first glance the Louisiane looks like a sugar bomb — rye, a liqueur and sweet vermouth in equal parts, with a couple of dashes of pastis — but this is one of those drinks that has an alluring alchemy about it, that is able to rise above the level of mere sweetness and become something entirely new. Interestingly, I’ve only ever seen this drink listed in one other cocktail guide: Bottoms Up , by Ted Saucier, which came out in 1951 (my copy, anyway); the recipe was near identical (everything was bumped up a notch in volume, but proportions remained the same). And then, nothing (though if someone’s spotted it in a guide that’s come out in the last couple of years, let me know) — which really astounds me, given the drink’s relative similarity to the Sazerac and Vieux Carre, along with its undeniable deliciousness. One of the provisions for the Raiders challenge is that the ingredients be somewhat common, so a curious drinker would be able to order it in a bar. I think the Louisiane comes close: perhaps the most obscure ingredient in it is Peychaud’s bitters, which are popping up with greater frequency; rye isn’t too hard to find anymore, if you’ll go for Old Overholt, and practically everybody has sweet vermouth. There’s also room to goose up the quality of the drink: a few dashes of pastis are required, which in most bars means a little Pernod or Ricard; if you’re lucky, the bar will have some Herbsaint on a shelf, that adds a little extra authenticity to this New Orleans drink, along with a little ruggedness; and if you’re really lucky, your bar has supplemented its pastis selection with a bottle of Lucid or Kubler, genuine absinthes that will elevate the drink to another dimension. I love this cocktail! It was introduced to me when I first started working at Green Street when it (re)opened in April of 2006. The new owner (and my good friend) Dylan Black put it on his first cocktail list. I fell in love with it and so did our guests. It’s a favorite of many of our regulars and the staff as well! Excellent, excellent choice for this month’s Raider of the Lost Cocktail, Paul! It’s such a simple concoction, and the ingredients make it a viable order at most decent bars. Coincidentally, while driving home through the Seattle snow today, I was pondering an autumn-ish rye drink with a pastis edge, and recalled that Murray had written this down on a coaster at the Zig Zag for me a couple years ago. Thought I’d make a quick perusal of my favorite blogs and lo and behold there it was on your site. I’ll be reaching for the Rittenhouse and Lucid momentarily … cheers! I was looking for a good drink to warm me up on this chilly evening. I’ve mixed one and it’s delicious. Paul, this is wonderful, thank you for bringing it to my attention. Yes, the Louisiane has been a favorite of mine for some time, and a cocktail, I’ve found, that frequently stumps the experts. I’ve gone into such high-toned cocktail joints in NYC as Little Branch and met bartenders who had never heard of it. Sweet! I’ve got a recipes website but I don’t have any drink recipes so thanks for this one. i love me some vermouth.